Maybe it’s just that I grew up with Enema of the State and heard nothing but songs of teenage rambunctiousness lasting well into their twenties, or the social drama that we perceived to make us “cool” or not… they were fun and they were funny. That’s what we loved about the band’s videos and their sound. But this isn’t the same band anymore. You could see the change coming in Pants and Jacket and it really hit home on Blink 182. These guys have grown up. What they’re singing about is some heavier motifs in life. From divorce, depression, abuse (both physical and mental) and they now have a message other than party and have fun. Is the new Blink worse than the old? Yes and no. They still have the sound that is unmistakably theirs and they can still put on a great show (just saw ’em at SPAC a few weeks ago) with laughter and their immense stage prescence… and Travis’ drum solos (my head would explode if he and Neil Peart did a drum off.) They had glimpses of this on earlier albums, from “Adam’s Song” to “Stay Together for the Kids” to “Easy Target” and “All of This” but never had these songs of seriousness engulfed an entire album. Blink 182 was a band that got us through, or helped us hold onto, our adolescence and our youth. Now, maybe because most of them now are parents, and are seeing things from the other side of the fence, have a message to the kids who’ve been used and abused by parents and peers. Now THIS is more like it! Where Cold was, umm, cold, Estrella is, well, it’s cold as well, but in a much more interesting way, more along the lines of The Burning Circle and Then Dust, and the two Tara tracks off Cold. It’s probably no coincidence then that Tara takes on most of the vocal duties here. Most of the songs attain a majestic, if a little disturbing and creepy, glory, marked by the usual Lycia imprints of haunting swirls and scorching guitar. A satisfying fullness of sound and melody permeates every stark corner and half-forgotten wasteland, delivering the music of the stars. As if tapping into some ancient memory of archaic tribal rituals, “El Diablo” and the wordless “Tongues” raise the hairs on the back of your neck, in true Lisa Gerrard fashion as they weave exotic mosaics of utterly mesmerizing sound. You often have the sense of overload, as if staring into a bright light, but once overcoming the relative austerity of the surroundings you can clear away the fog and impending doom to marvel at the remarkable sights. “The Canal” creates another wordless, repetitive groove, a dramatic incantation summoning unknown powers from across the universe. I once witnessed Trance To The Sun perform something like this, and it was both unsettling and rapturous. This album, and Lycia in general, demands volume to do them justice. And if the surroundings become a little too ominous, “Estrella” and “Silver Sliver” lighten the load by sounding uncharacteristically upbeat and beautiful in a much brighter and less demanding sense. Lycia made a smart move on this album. Tara’s voice is perfectly suited to the music, and the regained melodic content and more exotic flair now and then etch themselves firmly in your subconscious without becoming irritating. Estrella is a remarkable feat of balance. 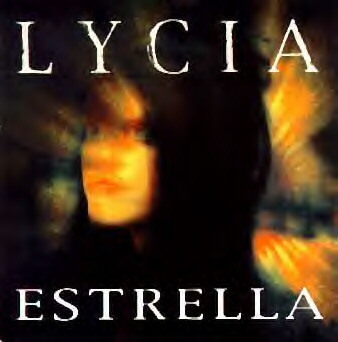 Lycia’s Estrella gets 4 out of 5 stars. Making a Lycia album was always a formulaic undertaking for Mark Vanportfleet and Tara Vanflower: slow down your drum machine to a crawl, wash dramatically dark layers of synth over everything, emblazon tortured guitar licks and low humming bass across the night, whisper phrases sepulchrally as if you’re trying to frighten the children and just make everything sound like Armageddon is just around the corner. Something happened with their previous one The Burning Circle and then Dust (review coming soon). Whether it was a favorable alignment of the planets or a temporary exorcism of dark spirits we’ll probably never know. Lycia created an amazingly rich and darkly gorgeous double album full of vibrant, brilliant sounds using virtually the same formula outlined above. It was more than enough to earn them my highest rating. Here and now, however, the stars don’t shine as brightly, and the dark muddiness has crept back in. Rather than uplifting paeans that ache to be played as loud as you can stand, all but two of the nine tracks become mired down with atonality and lack of direction. The two that rise above all else are the ones sung by Tara: “Snowdrop” and “Polaris.” The latter shows they can still deliver chills of pure delight. It’s repetitive, trance-inducing nature pervades all, and when Tara begins singing actual words besides “laa” most of the way through it will feel like you’ve been transported elsewhere. Their next album, Estrella (also reviewed here), moves into this area a little more firmly, I am happy to say. Always slightly disturbing, but also fascinating now and then, Lycia sound utterly unique. Use sparingly for greater reward. 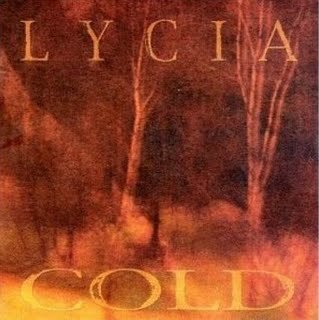 Lycia’s Cold gets 3.5 out of 5 stars. If you work an office job like me and need some mellow background music check out the Iron and Wine website for some free music. Click on the Discography link and a few full length albums are available to listen to in their entirery, nice eh? Free albums include The Creek Drank The Cradle (2002), Our Endless Numbered Days (2004), and The Shepard’s Dog (2007). The Creek Drank The Cradle was reviewed earlier on this blog. If you click the News link on the website and scroll down to the 3/24/09 date you will find 8 alternate versions from The Shepards Dog free to download. Anyway, thought it was cool that Iron and Wine would make this music free, enjoy. Iron and Wine’s Creek Drank The Cradle (2002) is one of those albums that you go back to time and time again on a rainy day. 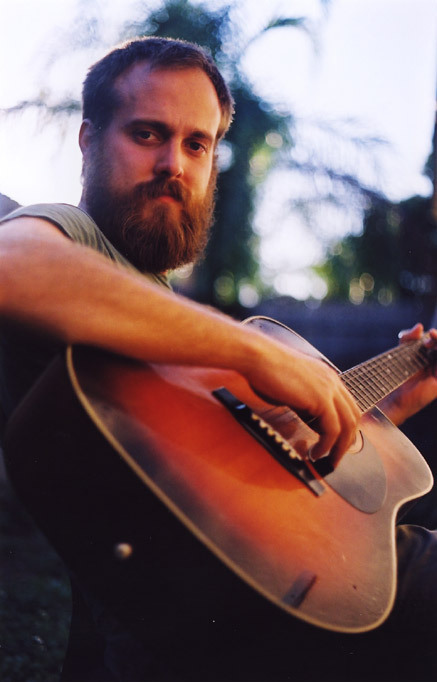 Iron and Wine is basically comprised of one person, Sam Beam. Beam’s songs are personal and sincere with lyrics well thought out and developed. Much like Elliot Smith’s solo acoustic work, Beam’s songs are lonely, gentle, and times very meloncholy. Beam does an excellent job of creating a unique sound that brings a nice fresh feel to the alternative-folk genre and his popularity has grown as a result. This particular album is nothing short of genius and there are no songs that are weaker than others. Highlights that I suggest on this album are “Bird Stealing Bread”, “Upward Over the Mountain”, and “Weary Memory”. I’m sure a few listens and you will discover your favorites in no time. Iron and Wine has released several albums after The Creek Drank the Cradle and you will hear some new directions that Beam pursued, however, I feel that you will drawn back to this album time after time. If you like this album you should check out Our Endless Numbered Days and Woman King since both albums compliment each other in numerous ways. The Creek Drank the Cradle gets a 5 out of 5.